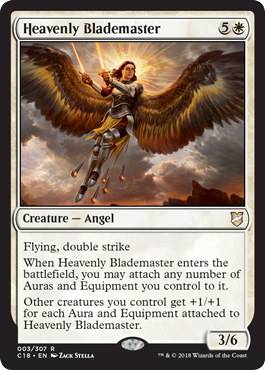 Heavenly Blademaster’s abilities require you to already have a rather significant presence on the table, but that’s okay: they’re designed to break the stalemates that occur quite often in multiplayer. She’s actually pretty good at that, as the evasion and double strike combo is one that you rarely see, especially on a creature with more substantial combat stats. And despite the promise of enormous swingy plays, she actually makes an equipment-using deck much more dangerous just by doing what it does anyway. Consider that a simple card like Bonesplitter will let her attack for ten damage while effectively doubling as a Glorious Anthem for any tokens or support creatures you may have. That’s the sort of thing that might help aggressive decks in the multiplayer environments they often find difficult. Heavenly Blademaster: also known as a way to make the skies open up with a rain of heavenly bloodshed and glorious violence. In theory! The Blademaster has a very specific shell it wants to slot into, an Enchantress-styled shell that loads up one creature with a bunch of stuff and sends them careening into the endzone. Think along the lines of the original Bruna, from Avacyn Restored. And doing so makes the rest of your creatures bigger, which is good. This creates a weird bit of tension, as Voltron-style decks usually go all-in on one threat, but the Blademaster fights better when she leads an army into battle. That said, Heavenly Blademaster can do work. It’s way too expensive to appear outside of Commander, but it is a 3/6 with double strike and a tendency to get really large very quickly. Double strike in the air is enough to wreak havoc in most cases, and when paired with the right pieces, she can end the game on the spot.